Own a Piece of League History! 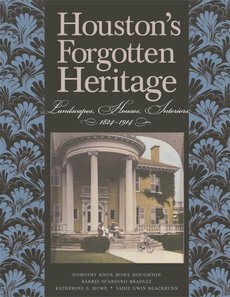 The League is pleased to offer its members, patron members and friends an opportunity to own the re-printed Houston’s Forgotten Heritage: Landscape, Houses, Interiors, 1824 – 1914. The book, authored by League members as a League-sponsored project and first published in 1991, paints a broad picture of domestic life during the first 90 years of Harris County’s settlement.